This ad is for a single Prowler Rubber Track to fit your Bobcat MT52 Mini Skid Steer Loader. The size of this track is 180x72x39 . Although you can operate upon Gravel, and Paved Lots you'll get the best service life and efficiency while operating within the suited applications mentioned above. This Bobcat MT52 Rubber Track has a nice deep tread lug for increased traction and maneuverability. If you are looking to use your Mini Skid Steer to pull brush, fence or other tasks typically performed with your machine, our tracks will provide the extra strength needed to withstand the extra torque and forces applied to them. A Premium Grade track is made of all natural rubber compounds that are blended with highly durable synthetics. A high Carbon Black content make our tracks more heat and gouge resistant, increasing the overall service life of the track when operating on hard abrasive surfaces. Premium tracks also use continuously wound steel cable embedded deep within the carcass to build strength. Additionally, our steel cables receive a coating of Vulcanized Rubber to protect against deep gouges, and moisture that may penetrate through the channels created by these gouges. Standard Grade tracks use lower amounts of Carbon Black making them less heat and gouge resistant. Standard Grade tracks also use spliced or overlapped inner cords that are weaker than the continually wound cables, and generally do not coat the inner cords in vulcanized rubber, to keep their pricing down. Prowler is a Premium Grade Track System, and we utilize a unique manufacturing technique called FST (Flexural Strength Technology). The result of FST is a track with a hard, abrasion resistant outer circumference and a more flexible, and resilient inner circumference. This creates a track that can flex more freely while engaging your undercarriage components while maintaining its abrasion resistance to hazardous debris. Should you have any questions about Prowler Rubber Tracks for Mini Excavators, Track Loaders, Mini Skid Steers and Carriers, please call, and allow one of our product specialist to assist you. RubberTrack.com is a eCommerce website developed and maintained by Prowler MFG located in Greensburg Indiana. 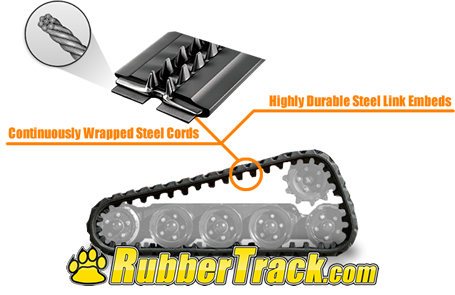 Products sold through this website are backed by Prowler MFG, and should be directly contacted if you have a warranty claim or concern about your rubber track.